Last winter’s flooding caused landslides, road and bridge washouts that have closed Middle Fork Snoqualmie River Road to motor vehicles at milepost 1.4 at the end of the couplet. Although the road will be opened temporarily on weekends to milepost 2.4 to give access to Mailbox Peak Trailhead, it will be closed to motorized vehicles from there through milepost 18.5 in the Mt. Baker-Snoqualmie National Forest. 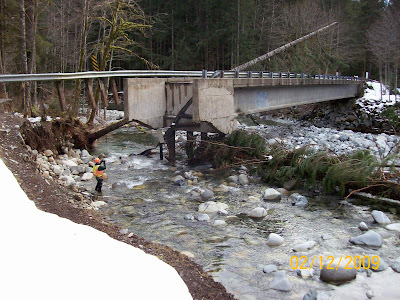 King County and Forest Service engineers estimate finishing the repairs this summer or fall. For information call King County at 206-296-8100; or Forest Service at 425-888-1421. Taylor Bridge on the Middle Fork Snoqualmine road.